ASA Chairman’s Message: The Winds of Change - AutoInc. Those involved in the business of automotive mechanical and collision repair cope with change on a regular basis, whether it’s related to new technology, new materials, or new diagnosis and repair processes. Keeping up is a full-time job and it has been my honor to serve as chairman of an organization that is dedicated to keeping our industry trained, informed and educated on what is coming down the road. As my term as chairman draws to a close, I’d like to take this opportunity to thank the ASA membership, board and staff for their encouragement and support over the past two years. This has been a time of incredible change within your association just as it has been in our industry. I’d also like to offer special thanks to Darrell Amberson for his service as his term as Past Chairman ends and welcome Bob Wills as your new Chairman as I look forward to continuing to work on your behalf as Past Chair. As I said, the changes don’t stop coming, and Ray Fisher, ASA’s new Executive Director has hit the ground running and put together an outstanding lineup of training and presentations for our annual business meeting. If you haven’t yet signed up to attend this year’s event in the Dallas-Fort Worth area, I encourage you to do so. It’s a chance to see and hear all about the many ways ASA works for you and meet some of the people who represent your best interests in Washington, D.C. and at the state level. It’s also a chance to take advantage of some of the best training available that will keep you up-to-date on the latest technology, best business practices and provide insight and understanding on some of the most pressing issues facing our industry. The opportunities for learning continue throughout 2019 with ASA’s MSO Symposium for collision shop owners with multiple locations. It’s scheduled for July 25th in Indianapolis and coincides with the Collision Industry Conference meeting. For mechanical shop members, the Technology and Telematics Forum is scheduled for Sept. 12 in Troy, Michigan. Both the MSO Symposium and TTF have grown over the past few years and are among the most popular events ASA offers exploring the forces that will shape and define the future of our industry. As ASA continues to grow and evolve to meet the challenges ahead, we’ll continue to announce new programs, benefits and updates as they are added. In my time as a member of ASA, I have found much value in that relationship both personally and professionally. 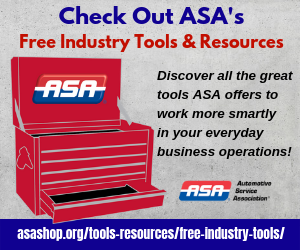 As we work to recruit new shop owners into your association, the new ideas they bring will continue to improve ASA and build on that value in the years ahead.